This illustration/graphic showcases a time-line of Townline’s corporate milestones in chronological order. This 3-fold-spread appears in Townline’s corporate brochure. See also the Townline Presentation Folder, Townline Corporate brochure, and the Down to Earth logo. See all projects tagged ‘Townline Group of Companies’. This illustration, an elevation view of The Salient Group’s three developments on Water Street (from left to right, The Alhambra Building, Garage, and terminus) was created for the cover of a presentation folder, but was never produced. See also The Salient Group Terminus Storefront Signage, The Salient Group Corporate website, and the Terminus brochure. These illustrations of various audio players, and a mock-up of the product in use was used on the Shelter’s packaging, as well as in print ads. The ‘Shelter’, is a heavy-duty neoprene audio player holder, worn around the waist for use when riding your bike, or being active. See also Shelter packaging and Ronin ads. See all projects tagged ‘Ronin’. Footage was all filmed at the 2006 Toronto Metro Jam at the Ricoh Coliseum. Song: ‘Hip Hop’ by Mos Def. See also Metro Jam Contest Logos, and Metro Jam Contest ads. See all projects tagged with ‘Metro Jam’. Footage was all filmed at the 2005 Toronto Metro Jam at the Ricoh Coliseum. Song: ‘Like Eating Glass’ by Bloc Party. Things have been pretty quiet over the last few weeks… Which is a good thing. I’m making really good headway on my design portfolio website, which is both tedious, and a joy. It’s been fun pulling a few of my older projects from the hundreds of CD’s and DVD’s boxed up in storage, cracking open the odd vintage Quark file (with InDesign of course) and creating nice previews/layouts of the projects. Mixing up a bit of my older stuff with all my latest stuff, and putting it all side-by-side is pretty interesting. I’ll weed through it all once it’s all together to see what makes the final cut… Above in the graphic you can see a few things that probably won’t be making into the final collection, but it’s been nice to get it all into place just for my own records. There’s been lots and lots of projects over the years, but I’ve noticed that it’s amazing how much of the website work just slips through the cracks. Or even worse, there’s so much web work that’s just no longer live, and sometimes screen captures don’t do the websites justice. I’m going to try and stay on top of it better now that this new portfolio is built using WordPress – that will really make it easier than ever stay on top of this all this stuff. I’ll be photographing some of my work as well, but I’m saving all that to do at one time when I have everything pulled together, and I know exactly what I need to shoot. That’s all I’ve got going on for now… Back to it. 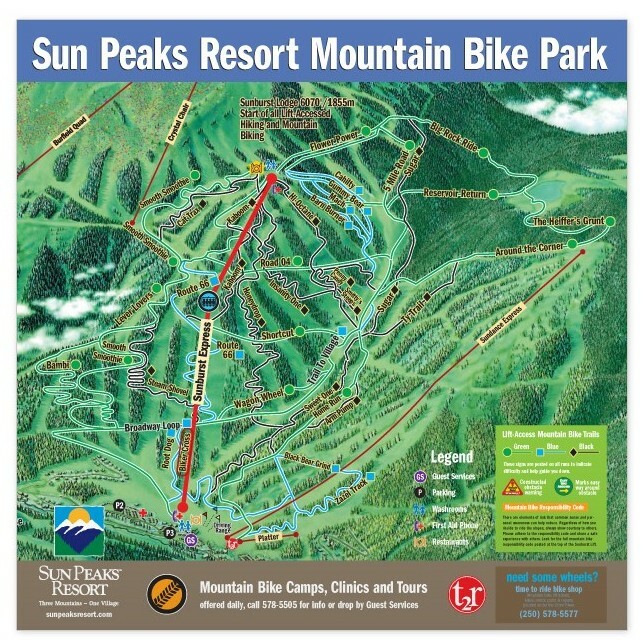 See also the Sun Peaks Summer Trails Map Brochure. With the downturn in the markets – particularly real estate, which I’ve spent much of the last several years focused on, what better time for a developer to reflect on their website? Companies always seem to make the mistake of cutting back on their advertising, and web presence in times like these, but that need not be the case. I’d started on some comps and wireframes of a new website for the The Salient Group some months back, when the market was really hot, but there just wasn’t the time needed to devote enough attention to it. Fast forward to February of 2009, and the markets had cooled (to say the least). Salient wanted to take advantage of this time to get the new website (version 2.0) back on track, and take advantage of all the latest and greatest forms of communication and social media integration.